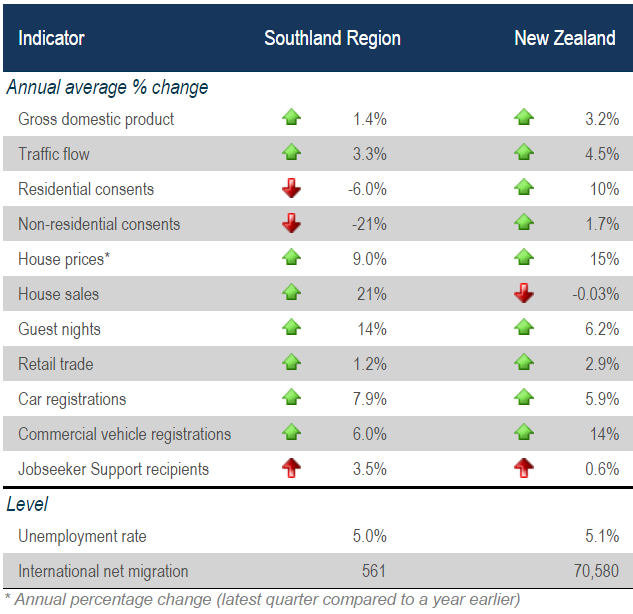 Economic conditions in Southland improved slightly in the December quarter, with Infometrics’ provisional estimate of GDP showing growth of 1.4% over the December 2016 year. Improvements were seen across a range of indicators, including retail spending, vehicle sales, guest nights and migration. Traffic flows rose 3.3% over the year. A deterioration to the number of Jobseeker Support recipients does still show there is a vulnerable group that is not sharing in these better conditions. However, a brighter outlook for key sectors of Southland’s economy is likely to see better job prospects in 2017. The rally in dairy prices through the second half of 2016 looks set to propel Fonterra’s farmgate milk price to $6.00/kgms this season. A price of $6.00/kgms would push the total dairy payout (excluding dividends) in Southland to almost $1.4bn, up from $868m in the 2015/16 season. Even so, farmers’ first priority will be reducing debt levels so any spending lifts will be modest. Although lamb prices took a tumble in the December quarter, a tighter supply of New Zealand lamb and strong demand out of China and other parts of Asia has pushed up lamb prices so far in 2017. Aluminium prices have recovered significantly over recent months and in February were 18% above their September trough in New Zealand dollar terms. Southland’s tourism sector enjoyed a bumper 2016. Total guest nights soared 14%, driven by a 26% lift in guest nights by international visitors as a lack of affordable beds at peak times in Queenstown pushed additional demand into Southland. Data from MBIE shows that visitor spending in Southland totalled $599m in 2016, up 6.8% from its 2015 level. International visitor spending climbed 17% to $238m in 2016, while spending by New Zealand visitors rose a mere 1.1% to $361m. Domestic visitor spending growth was sluggish throughout much of the South Island, with the notable exceptions of Otago and Nelson-Tasman. Demand for housing in Southland rose in 2016, with prices lifting 9.0%, while sales climbed 21%. People are attracted by affordable housing, a good lifestyle proposition, and relatively low levels of underlying unemployment. Higher prices are beginning to renew interest in building. Although the number of residential building consents over the 12 months to December was 6.0% below its 2015 level, consents during the December quarter spiked to their highest level for a December quarter since 2008. This additional residential work will help keep builders busy, at a time when few consented commercial builds are in the pipeline. Contact Benje Patterson (benjep@infometrics.co.nz) for more details about the Infometrics Quarterly Economic Monitor.